An innovative new government-led solar panel scheme is set to cut energy bills for up to 800,000 low-income homes across 40 local authorities in England and Wales. The initial phase of the scheme will see 100,000 residences fitted over the next 18 months, with occupants of a sheltered retirement home in west London being the first to benefit, with the remaining panels being fitted within the next five years. The panels will be supplied and fitted free-of-charge by Solarplicity, one of the UK’s leading renewable energy providers, and are expected to cut energy bills by an average of £240 a year. David Elbourne, chief executive of Solarplicity, said: "In the past, the feed-in tariff meant that people who could afford to have solar, benefitted from solar. But now people who can't afford to have solar - we'll put it on the roof for free - and they will get a reduced energy bill." The scheme will come as a welcome boost for councils that have had to curb their own initiatives following the government’s decision to reduce the feed-in tariffs – a cut in the returns offered on electricity generated from community schemes meant some were no longer financially viable. For more on this, check out Are subsidy cuts and policy changes curbing community renewable energy schemes? The scheme will also create more than 1,000 new jobs to install and maintain the panels, with many of these jobs being targeted at veterans from the armed forces. It’s estimated the project will cost around £1 billion in total, £160 million of which has been provided by Maas Capital, a Dutch investment firm that is part ABN AMRO banking group. Greg Hands, Minister of State in the Department for International Trade, said: "After a record year for new foreign investment into the UK, this initial £160m capital expenditure programme will deliver massive benefits to some of the UK's poorest households. He added: “As well as creating 1,000 jobs and delivering cheaper energy bills for up to 800,000 homes, it shows yet another vote of confidence in the UK as a place to invest and do business." The north-west is set to benefit most from the plans, with almost 300,000 homes across towns including Oldham and Bradford receiving solar panels, followed by the north-east and midlands, with 184,000 installations, then 154,000 across homes from Leeds to Derby. 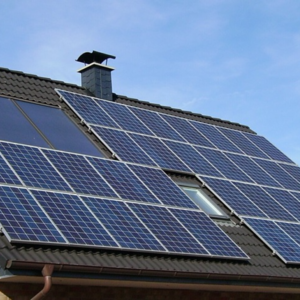 Have you had solar panels installed? Has it significantly cut your energy bills? Share your experiences with our energy saving community on Twitter and Facebook .